Zoodles of zucchini, swoodles of sweet potato, toodles of turnip, and more: food-lovers everywhere are creating oodles and oodles of long, bouncy noodles — spiral-cut from colorful vegetables! And, it’s no wonder: whether you cook them gently and top them with pesto for a carb-free pasta dinner or crunch on them raw in a refreshing salad (with just a touch of homemade lemon vinaigrette), there’s nothing like a big bowl of fresh veggies to make you feel good inside and out. Delicious, easy-to-make, and oh-so-good-for-you, a quick salad of raw zucchini noodles is one of my favorite seasonal eats. The simplicity of this preparation means that I can enjoy a wholesome meal even when the easy, breezy days of summer keep me from the kitchen. The adaptability of the dish allows me to keep things interesting! 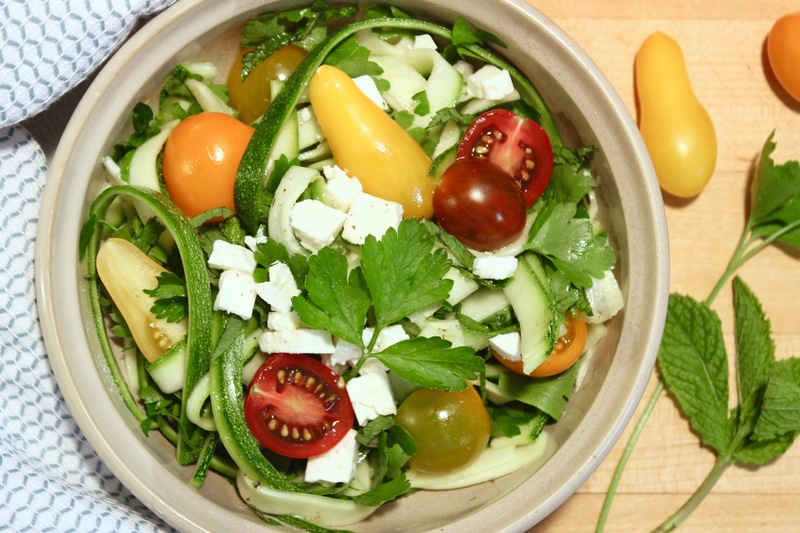 The idea for this salad started a few years ago when the zoodle craze first sprung up; I wanted to make a batch of my own but didn’t have a spiral slicer. Then, I remembered one of the sous chefs at the 21 Club. Each afternoon I would find her in the same spot, executing the same task as the day before: standing behind the stainless steel counter in the coolest part of the prep kitchen, carefully peeling what looked like an endless number of asparagus spears. The more I thought about my desire to make zoodles, the more clearly I recalled her — and the long, thin strips of asparagus being shaved away from the sturdy stalks. And then it gave me a thought: why not slice the zucchini with a vegetable peeler and cut the strips into fettuccine-like strands? So, I did. And, I dressed the zucchini with a little olive oil, lemon juice, and salt. And, I topped the salad with fronds of fresh dill, toasted pine nuts, and a bit of crumbled feta. The results? Crave-worthy. Lately, I’ve been making new versions, using the zucchini ribbons and simple lemon vinaigrette as my base and topping the salad with whatever I have on hand. 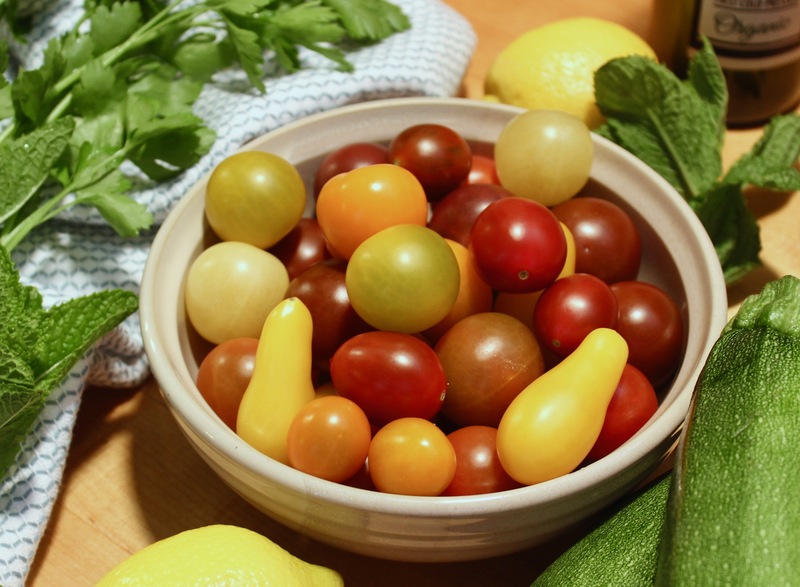 This time of year, that’s colorful heirloom tomatoes and aromatic green herbs. 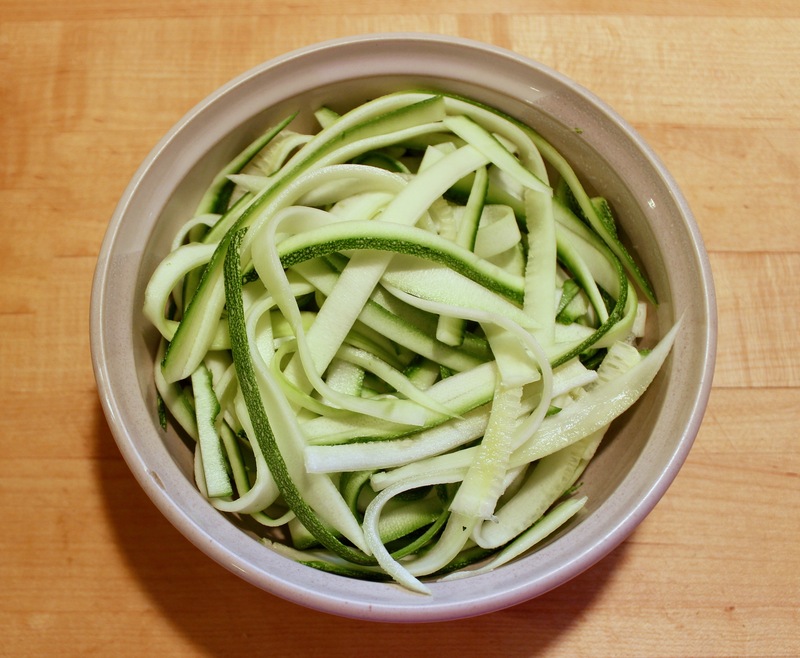 Use a peeler to cut the zucchini lengthwise into strips. Stack the strips into a few piles and use a knife to cut them into ribbons, lengthwise. Set aside. Combine the olive oil, lemon juice, and salt. Whisk to combine. Pour the dressing over the zucchini ribbons. Coarsely chop fresh parsley and mint leaves. Add to the bowl. Toss the salad to incorporate the herbs. Then top with tomatoes and feta.